My current hangover cure of choice is drinkwel vitamin supplements, a lemon-lime Gatorade and sleep. But when it comes to hangover prevention, one can never be too prepared. This is why I decided to give Function’s Urban Detox a try. That, and Function was kind enough to send me a few bottles to try for free. I decided to see if Urban Detox could replace Gatorade as my post drinking, drink of choice. Because let’s be real. Just because something has antioxidants, doesn’t mean it’s going to erase those six beers, four patron shots and two four lokos you downed. It’s just not. With that in mind, I gave Function’s Urban Detox Citrus Prickly Pear a try. There are other flavors, but this review will focus only on the Prickly Pear flavor. We’ll start with the taste. In short, it’s delicious. It’s less syrupy than Gatorade and better tasting than G2. I have yet to come across another drink that tastes similarly. But there’s more to the Prickly Pear than just taste. According to the label, it is one of the ingredients that helps prevent hangovers. Specifically, it’s supposed to relieve those pounding headaches you feel the next day. After drinking heavily, downing a couple bottles and waking up to a pounding headache, I don’t know about all that. Without combining Urban Detox with some of my other hangover prevention methods, I was left in some serious pain. 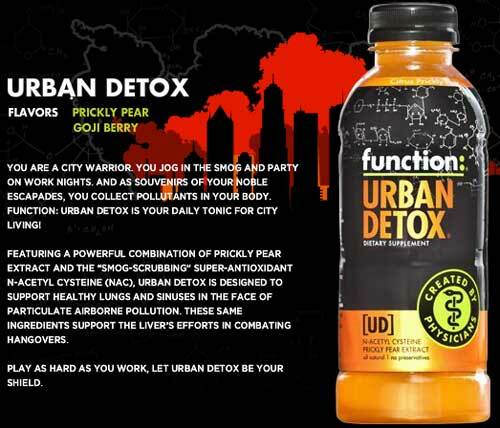 But while I can’t vouch for its ability to stop hangovers on its own, I can say Function Urban Detox is a great alternative to the sugary Vitamin waters, Gatorades and other “healthy” drinks available. Because when combined with other hangover prevention methods, Urban Detox proved to work just as well as the other drinks. Give it a try and leave a comment with your thoughts. Great info, thanks for sharing! Do you know what other flavors it comes in? Function Urban Detox is amazing! It tastes Great, and makes me feel great as just a morning drink! The best I’ve ever tried! Just drink a cold bottle the morning after a long day running around working, It has me wishing I had more! I have tried urban detox before, actually by accident when I was at a party and someone brought a case, I started using it as a chaser for whatever I was taking shots of. But the next day I couldn’t believe how good I actually felt after drinking so much, it really is amazing!! But I’m living in the UK right now and can’t get any shipped here?!?! :(( PLEASE ship to the UK!! I need this in my life and so do all my friends!! Bodyarmor SuperDrink is the best hangover cure I have found. It’s twice as hydrating as Gatorade and is pack full of potassium which is great for recovering from a hangover. Drink one before you go to bed and you’ll wake up feeling great! thanks for the information. i have a short question. there’s a exercise routine that is in use by a lot others now. i’ve looked around a lot sites to see if this actually works as people point out it does. people have good things to say on the program and even i have seen results from it as i have been giving it a go for 3 weeks as of now. could anyone let me know what do you think of it? right here is a review of it. http://workout-reviews.net should i remain on this regime since it’s working out very good. I have been suffering from a bout of bronchitis and sinus problems for the past five weeks that have driven me crazy. I came upon Urban Detox today in our cafeteria at work and thought I would give it a try. This stuff WORKS!! It opened me up for the first time in weeks. I have tried every vitamin and herb but nothing cleared my sinuses and congestion. I cannot believe what one bottle did for me!! I am buying thus stuff by the case! I just bought 10 bottles yesterday. So far I’ve had GOJI BERRY, POMEGRANATE CHERRY and CITRUS PRICKLY PEAR and I love them all. I found out about Urban Detox while searching for prickly Pear vitamins. Urban Detox is now my drink of choice. I can’t speak for prickly pear extract, but I can certainly say NAC, the other special ingredient in Urban Detox, is a magnificent hangover cure. Anytime I know I drank enough to continue seeing double the next day, I take a few NAC capsules with a glass of water before I go to sleep and feel fresh as hell the next day. Just found this drink tried the Acai Pomegrante first…liked the flavorful taste,now Im at the Citrus Prickly Pear Urban Detox.love the flavor not sweet at all no after taste like gatorade,and no heartburn as thats what happens to me when I drink a full 32oz of gatorade,like the citrus flavor it leaves on the tongue. I bought 10 bottles and so far so good.Thanks finally something thats lives up to its advertisement! I found that this is excellent for cleaning out things in your body that cause allergies. I had a runny nose for months doctors could not find me a cure to it, drank this drink for 2 days and it was gone. Everything I start to feel sick I drink a bottle of this stuff and it flushes my inside out and makes me feel great a lot quicker. I never bought it, the bottle looked so funny that I didn’t know what’s all about. But now maybe I’ll give it a try. Today is Day 65 out of 100 and I still have my day job, my health and my relationships. I’m not an employee of function, I’m just a dude who’s testing the drink. It works! Follow each day on my site and on twitter!